What does this mean? Let’s take a hypothetical case where 7 members of a drug ring have been arrested and are being tried. By the precedent set by our country’s top prosecutors in the HSBC case, the drug ring should pay a fine of approximately 5 weeks worth of the drug ring’s profits, (let’s say $100,000) and face no criminal charges in the matter. If the prosecution is seeking any harsher penalty than this, it becomes the jury’s responsibility to find the defendants not guilty, as this would be the only reasonable course of action for any sane, intelligent, and fair individual, in light of the Justice Department actions in the HSBC case. I believe this is known as jury nullification, where the jury gives a not guilty verdict when they disagree with the illegality of the crimes in question, or with the penalty being sought. If you were on the jury of a case where a 12 year old stole a candy bar, and the prosecution was trying her as an adult and seeking the death penalty, would you vote guilty? Maybe not. A more likely scenario for our fictional 7 person drug ring case would be: the police have already confiscated $970,000 worth of cash, drugs, vehicles, and other property, then sold it to buy Ford Explorers, SWAT gear, and machine guns, and the defendants are each facing 15 years to life in prison. This would call for a not guilty verdict, unless prosecution gave defendants back $870,000 and dropped all criminal charges. One person voting not guilty would at least create a hung jury and cause a retrial. Another conclusion I have come to regarding HSBC’s money laundering came to light during a conversation with a friend. “D” mentioned her home mortgage is through HSBC, and was concerned that the act of making her mortgage payment could get her in legal trouble. The facts of the matter: HSBC laundered money for known middle eastern ‘terrorist’ organizations. According to the U.S. government’s official ‘terrorism’ policy over the last decade, giving aid to terrorists = you are a ‘terrorist’. If “D” pays the interest on her mortgage payment to HSBC, a known ‘terrorist’ organization, thus giving them money as profits, this makes her a ‘terrorist’. This means she is eligible, under NDAA 2012 and 2013, to be imprisoned forever without charges or a trial. Also, should the Obama administration decide they don’t feel like having her arrested, she can be murdered by an extra-judicial drone strike, after being put on the “Disposition Matrix” (Murder Matrix) and chosen for death on ” Terror Tuesday” at the White House. Sorry “D”. http://www.nakedcapitalism.com/2012/12/ian-fraser-hsbcs-1-9-billion-settlement-sets-another-dangerous-precedent.html – good video at bottom of link. After being unable to find complete and reasonably unbiased data on the topic, I did some research on actual overall tax rates paid to the U.S. Treasury by corporations and individuals over the past 20 years. I do a lot of reading on financial matters, and don’t recall seeing what I came up with presented in the way I came up with to present the data, so I felt I should share it with you. The two questions which come up first with data like this are usually about where the raw data came from, and how that data was used in figuring the final presentation. I will attempt to explain my methodology as thoroughly as possible. One of the troubles I had was finding all the numbers necessary to figure this chart from one source. Total corporate profit data came from the St. Louis Federal Reserve Bank Economic Data archives. I zoomed in on the chart for this data and got the most accurate annual total I could. Total corporate income tax paid to Treasury was sourced from the White House Office of Management and Budget historical data labeled “Corporate Income Tax” I feel both of these sources are as accurate and reliable as one could find on these matters. At the very least we are comparing apples to apples. 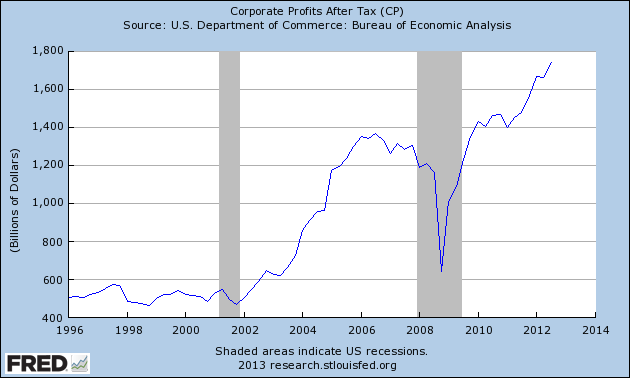 The FRED data I used showed total corporate profits after taxes. By adding after tax profits to corporate income tax, we get gross income. This was then used to figure total taxes paid as a percentage of total profits. For the second chart I used the FRED data showing total compensation of employees paid for the gross total amount, and for taxes paid income tax plus social and retirement tax revenues from OMB. All income, Social Security, Medicare, and unemployment tax are included here as they are taxes paid to Treasury as a direct result of a person’s income and /or labor. All Social Security, Medicare, and unemployment tax revenues collected would not be going into the Treasury at all if a person did not first work to require these taxes to be paid. Also, the employer’s share of these taxes are accounted for as corporate expenses before profits are calculated, so it would not make sense to account for them on the corporate side of the ledger. There are other taxes paid by corporations, which are not included in these figures, such as customs duties, excise taxes, and such, these are also counted as expenses before total profits and income are established. Citizens pay other federal taxes as well; fuel tax, estate tax, customs tax, etc. which are not figured in these numbers either. We are just trying to compare tax rates for corporate income to tax rates for individual income. Now for some observations and thoughts on the data shown by my charts. First observation: WTF? Next, corporate rates have been at 10-12 percent for the past 3 years, and most likely will be around 12 percent for 2012, based on the data available so far. Every employee is responsible for tax revenues of 13.3 percent of every dollar they make, up to $106,800 per year, from just the employee’s share and the employer’s share of Social Security and Medicare taxes. Before 2011, this rate was 15.3 percent. This is before any income taxes are assessed. If Mary worked part time for a few weeks in 2010 and made $900 as her total gross income for that year, a minimum of at least 15.3 percent of that $900 ended up in the Treasury as payroll tax. This seems a bit ridiculous when all corporate ‘persons’ , from Bob’s Bait & Tackle, Inc. to General Electric or Citibank pay a total rate of 10-12 percent. Some would argue that low wage people actually take more from Treasury than they put in, that argument is irrelevant to these charts, as we are only looking at tax revenues, not expenditures. Corporations also get plenty of ‘welfare’ from Treasury, but perversely this type of welfare tends to get larger for larger and wealthier corporations. Regardless, this discussion is for another time. Some politicians, pundits, economists, and such claim that increasing corporate taxes would hurt the overall economy. “The economy” is an incredibly complicated and diverse beast. Many very smart people have spent their whole lives studying economics, and are still proven completely wrong at times on various matters. There are, however several ‘economic indicators’ which are commonly accepted as good measures of whether the economy is ‘good’ or ‘bad’. Three of these are the civilian unemployment rate, overall levels of the stock market, and our old friend corporate profits after tax. Going back to our chart, we see that the corporate income tax rate ran from 25 to 29 percent from 1996 – 2000. Once again using FRED data, we can see that unemployment in this period declined from around 5.5 percent to around 4 percent, corporate profits were basically flat, and using readily available stock market data the S&P 500 index increased at a robust 27 percent annual rate. Comparing this to the 2009 – 2011 period, with much lower corporate tax rates of 10-12 percent, we see the unemployment rate rising fro 7 to 10 percent, the s&P 500 rising at a 14 percent annualized rate, and corporate profits increasing by about 65% over 3 years. The period from 2000 – 2004 saw the corporate tax rate decrease from 29 to 17 percent, the S&P 500 fall at a 5.4 percent annual rate, and unemployment increase from around 4 to 5.5 percent. Correlation is not causation, and there are thousands of other factors at play, but one could argue from this data, at least over the period of the charts being studied, that corporate income tax rates do not seem to have a great effect on the overall economy. http://www.whitehouse.gov/omb/budget/Historicals/ – Table 2.1 for tax revenue information. http://research.stlouisfed.org/fred2/series/COE – Play with the edit graph function below picture. http://research.stlouisfed.org/fred2/series/CP – Corporate profits after tax graph.